A lot of reports get published that look at the state of CEIAG provision for young people in the UK and offer improvement ideas. As well as policy makers there are a vast number of stakeholder organisations in this arena and across areas such as social mobility, apprenticeships, vocational education that all overlap with Careers Advice. Some of these organisations are more upfront in the policy ambitions of their backers than others but all have found that publishing a report is a proven method of gaining those all important media column inches if you want to advance your agenda. Some sink, never to pass over the desks of Ministers while others take center stage in shaping Government thinking. The quality spectrum of these reports is wide and two came out recently that, to my mind, should be filed at the weaker end of the publication pool. as well as previous publications. The report includes quotes and stories that rehash the cliches of school CEIAG’s relationship to apprenticeships, including a lack of information regarding alternative to HE routes, a belief that apprenticeships were treated as a second class pathway and that high achieving pupils were actively discouraged from applying for them. The actual application figures of young people compared to the opportunities on offer, isn’t considered. Rethinking school league tables to include apprenticeships – this already happens. When you go the DfE school comparison site you can find individual school data through school name, distance to your postcode, through Local Authority area or through Parliamentary Constituency. Users can then scroll down past huge amounts of information about the school to find the Pupil Destinations – what pupils did after key stage 4 drop down menu and, hey presto, there is that information. You can also find this data about key stage 5 leavers on the 16-18 tab further up the page. but the sheer amount of other information means that users are left to navigate to find what is important to them. 2. Extra training and resources for Careers Advisers in school about apprenticeships – nobody is ever going to say ‘no’ to more resources or extra training which is why the DfE has contracted organisations across the country to offer this to schools. The provider across the Midlands is Workpays. They will come into school to offer provision for students, send you resources and offer training. The DfE has a page with resources for schools and advisers and the ASK (Apprenticeship Support & Knowledge) providers will come and offer events for students. The University of Sheffield is, again, recommending something that already exists. 3. Coordinated, single application process for apprenticeships – Guess what, it already exists. Find An Apprenticeship is not a great website (it’s text search is terrible) but it is a single, coordinated portal for apprenticeships. All of the apprenticeships, they’re all on there. What it is not though is a single application process as many apprenticeship vacancies require an applicant to click through to the employer website to register (again) and complete an application. This is something that is out of the hands of Government as many employers will insist on their own hiring methods that are standardized across their business for all job roles. This is part of the challenge when supporting a young person through a labyrinth registration process on a company website full of business jargon but it fits established employer HR practices. So all three of the recommendations for education are, to some extent, already in place which highlights how, while diagnosing problems with CEIAG provision may be achievable, offering solutions requires more a real understanding of the landscape. The other report that caught my attention was Averting a 90Bn GDP crises: A report on the image and recruitment crises facing the built environment carried out by Kier Group by polling “2000 secondary school teachers, advisers and parents.” The Group, a profitable player in the UK construction market, look very keen to play their part in improving student career advice by pledging 1% of their workforce to act as ambassadors and place a “virtual world plaque” on sites to help the public “explore a digital world of information on a project.” They hope that these initiatives will begin to change widely held views of their industry as their poll reports 73% of parents not wanting their child to pursue a career in the sector and, despite 76% knowing that apprenticeships lead to careers in construction, 45% wouldn’t encourage their child to take an apprenticeship when leaving school. To it’s credit the report gives context to the current CEIAG landscape by devoting a whole page the loss of funding and the placing of the legal duty on schools in 2012. Where the report fails to offer much value is, again, in the recommended solutions, both those from within the construction industry and from government, to improve the situation. Despite clearly identifying that parents are a persuasive and influential negative voice against young people aspiring to work in their industry they suggest nothing to then engage with parents. That parents are an important voice in shaping the career views of a young person is backed up by other data and we also have clear indications of how young people would like to receive their CEIAG and what types of provision help them most. An important type of provision is work experience and workplace visits, the report also fails to acknowledge or offer a proposal to grow the dearth of these opportunities in the sector. 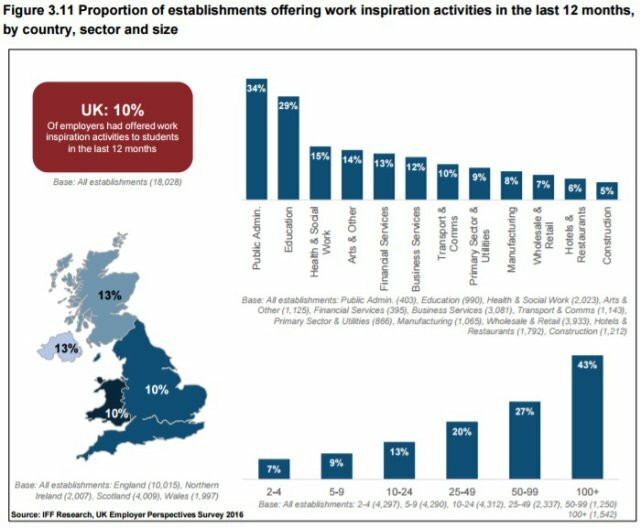 The 1% workforce ambassador pledge will hopefully, from a very low base, improve the number of work inspiration opportunities. 2. Mandate that every school gives children a minimum of three one hour careers advice sessions – the first session with a school advisor, follow up sessions with ambassadors from relevant industries. the report fails to then include the obvious point that these (uncosted) increases in service provision would require more funding. This shows a lack of willingness to bring up the funding of public services for the wider benefit and a failure to acknowledge the financial reality in schools. Reports that help shine attention to the issues with employer engagement and CEIAG in schools but also then offer constructive solutions that work within the realities of the landscape are to be welcomed. Reports that finger point at a Careers service under funded and unable to solve all of the problems laid at it’s door without significant collaboration and investment, only have one purpose; to shift the focus of blame away from the other stakeholders.